She is fifteen years old. For the entirety of her life, she lived on a small farm owned by a school. She was artificially inseminated time and time again, bred to produce baby after baby she never raised. And milked by hand to teach children "where milk comes from" as if the 9 million dairy cows in this country are strolling into pasture MILK ME at 7 in the morning for a hand milking. Seriously, school? This is not who milk comes from, at least not in the commercially successful sense. Anyway, let's remember Elsa is fifteen. And has spent all those years enjoying her pasture with her daughter. But three years ago, Elsa was too old too breed. The farm had no use for her. The farm manager liked Elsa. Everyone who met her did. How could they not? Gentle, sweet, endearing, approachable, tolerant. She endured much to garner these humans appreciation. Trying to avoid the inevitable, the farm manager kept Elsa at the school, ignoring officials demands that she be dealt with. Three months ago, the school decided to purchase draft horses. Large equines that took up barn space and ate food but were considered productive by the school. Unlike Elsa who ate grass and beet pulp and took up barn space. She had to go. And by "go", I do not mean she had to be sent to a sanctuary or that she had to go to another pasture where she could retire in peace in the comfort of a home she had known since calf-hood. No, I mean she was to be sent to auction, betrayed so cruelly by those who claimed to love her. She was to be killed, slaughtered, butchered, eaten. Her service, her unwilling participation in her insemination, breeding, birthing and subsequent denial of motherhood (with one exception)...all for naught. We agreed to take in Elsa at the sanctuary. There isn't a rational reason for why we said yes. It was a sad story and an educational one and our collective heart-strings were torn asunder thinking of the betrayal this so-called beloved cow was to endure. She arrived today. And she is so unhappy, so afraid, so panic-stricken that all she can do is low and moo and cry for her lost daughter and friends. The other cattle greeted her through the fence, welcoming her already into their own little world. We will most likely let her out tomorrow instead of after the two-week temporary quarantine we planned. 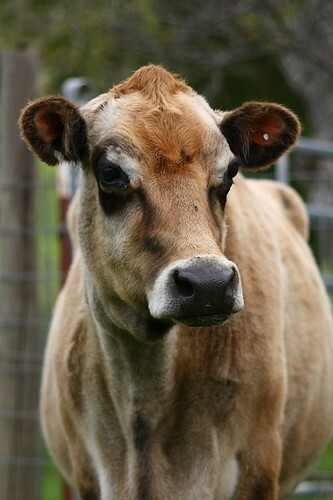 Her stress might be alleviated by being connected through grooming with other cattle. Someone emailed me today saying Elsa was grateful to us for rescuing her. She isn't. She wants to be where she spent the past fifteen years. The place she grew up and knew from top to bottom, pasture gate to barn door. The place she birthed nine calves, where she ruminated with her daughter. The place where the people were humans she knew and trusted, who brought her hay and affection. She wants to be home. She is not grateful. Not merely because it is unclear that cattle can experience the state of gratitude but because her behavior conveys a message of suffering and discomfort. I cannot tell her that this is a great place. For her, it is not. I cannot tell her that we are nice people. For her, we are humans intimately connected to this new, scary place. I can only give her apples and scratch her face and show her with my actions and body language that I mean her no harm. This will pass, I am sure. But this is a traumatic event for Elsa. It is not a happy beginning. It's a scary now. We hope by letting her out sooner that the psychological trauma of this move will lift easier, will leave her without too much baggage. She will never be milked or bred or used. She will be Elsa. Cow. Bovine. Individual. Smart. Gentle. Loud. Elsa. This is terribly well written and made me cry. I hope Elsa adjusts ok and I will be thinking of her. Life is very unfair. Also, would you mind very much if I posted this to my facebook? It really moved me. I hope she adjusts well too. I think the companionship of her own kind will facilitate that. such a sad story, and you write it so beautifully, i can't help but be in tears... rarely am i so at one with my choice not to eat animals as when you tell another story of the sentience and emotion of these wonderful individuals in your care. This really makes me happy. Sometimes I feel like I'm not doing anything helpful. Silly, myopic of me. You write with so much passion and empathy...but that's because that is who you are! Please let us know how she goes.